All of us know them!!! The followers of the sickest band from Vienna, Austria. Pungent Stench!!! 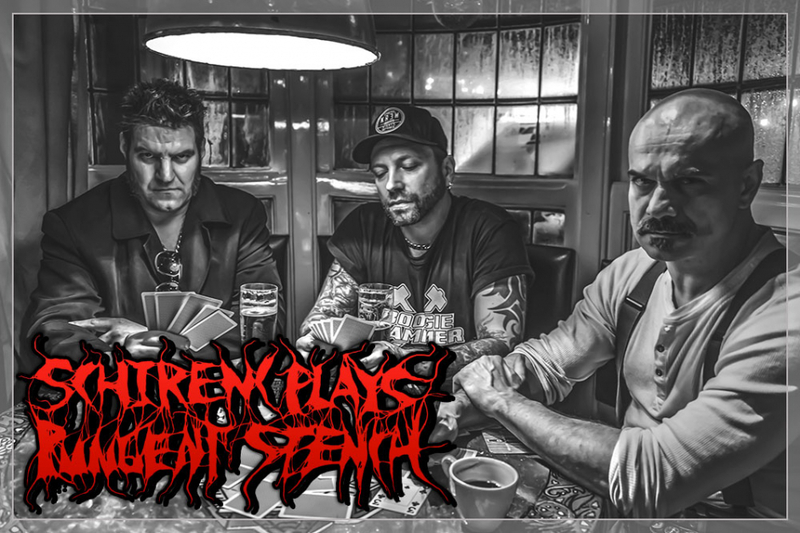 After the break-up of the band in 2007 the head of the pack Martin "El Cochino" Schirenc pursued other projects and put together a band called "Church of Pungent Stench" to rename it finally SCHIRENC PLAYS PUNGENT STENCH after a few more successful years!!! As the title suggests we can be looking forward to a live performance of immortal classic tracks of a band we all know and love!!! Martin, Danny and Mike will not spare us and give the famous OEF's moshpit a hard time!!! It is not going to be the premiere at the OEF 2019 for these bizarre guys as they played both in Trutnov and at the American version of OEF in 2015!!! Once they are finished, your soul will belong to God and your flesh to those who call themselves SCHIRENC PLAYS PUNGENT STENCH!!! The day Pungent Stench disbanded in 2007 marked the loss of one of death metal's most unique originators...and the calls for a reunion have not ceased ever since. Although disappointed by the sudden split, founding member singer/guitarist Martin „El Cochino“ Schirenc continued to release music and play concerts with various other projects, before he finally agreed to attend a Pungent Stench tribute show in Istanbul, where he played several songs from his former band under the moniker „The Church of Pungent Stench“. Supported by Mike Gröger (Hollenthon) on drums, as well as Hakan Nurcanlı (Art Diktator) on bass, this 2011 concert was a huge success. Subsequently, Schirenc received numerous offers from various promoters to also bring this show to other cities. It wasn’t until 2013 that Schirenc finally agreed to take „The Church of Pungent Stench“ on the road to grace stages worldwide. The new line up continued to feature Mike on drums, but also introduced a new bass player, Danny Vacuum, known for his involvement with bands like Genocide S.S., Necrony, and The Accidents. The first show took place at the Eindhoven Metal Meeting and only marked the beginning of a successful series of appearances at the biggest festivals in Europe (Neurotic Deathfest, SWR Barroselas Metalfest, Graspop Metal Meeting, Hellfest, Bang Your Head, Brutal Assault, Into The Grave) and the USA (70.000 Tons of Metal and Maryland Deathfest). Due to a legal dispute, the band was forced to change its name and is now touring as „SCHIRENC PLAYS PUNGENT STENCH“. However, the mission remains the same: bringing the music of Austria’s sickest band back to life and keeping the flame burning by refusing to praise the ashes!